As I grow older, my mind loves to wander at the end of the day. I think about what was special, what my conversations included and all the little and big things in my life that I am thankful for. Our lives took a major shift when we purchased the ever so lovely Brewster By The Sea bed and breakfast on Cape Cod in 2003. The changes in my priorities and daily appreciation list feels so much more real and sincere. In a word it all comes back to the “simple” things in life. 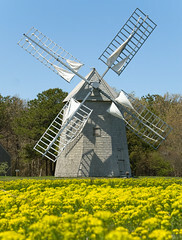 Yesterday, as I was watering some pansies in our front yard, my gaze drifted across the street to the beautiful wind mill that gracefully welcomes visitors to our lovely town of Brewster on Cape Cod. I look at that windmill daily but yesterday I realized what an incredible landmark and a beautiful part of history that is visible from many of the windows at our inn. I was taking that beautiful sight which I glance at many times during the day for granted. Yesterday, we also concluded the festivities for our annual Brewster in Bloom celebration with inn tours. While the day was dreary and many of our guests came with rain gear, what a pleasure it was to greet so many kind warm faces that wanted a glimpse of what life is like at our inn. This year our theme included sharing the chocolates we love to give our guests. We do a nightly turn down service that includes delectable truffles from Brewster Sweets. We also had a free drawing for a one night stay at each of the inns. All of our visitors seemed excited about the prospect of winning. We even had one couple return because they had forgotten to fill out their ticket and did not want to miss the chance of winning. So for me, my appreciation list for Sunday was simple and clear. I am thankful for the love of my husband and the health of our family. I feel blessed to live in such a beautiful part of the country and will smile each time that I look at the beautiful windmill across the street. I feel blessed to have landed into this wonderful world of inn keeping that allows me to meet so many wonderful people each day.